We have treated with people from all over the world in order to help them constitute civil marriages in Spain. And there are a set of questions that they keep doing to us. All of the time. Through this post, we are determined to solve them all. We want to clear all the doubts from your mind so you can join your partner legally in the easiest possible way. Why put that much emphasis on this kind of legal procedure? Because it is one of the most direct and easiest ways to get your residence permit as a relative of a member of the European Union. We have collected the 9 most frequent questions our clients make whenever they begin with the procedure of the foreign marriage in Barcelona, and we resolved them all for you in this post. They are all based on the application of the Law 2/2003. Are you ready? Which are the requirements to constitute the civil marriage in Spain? Of both members of the relation, the European Union citizen must reside on the territory. The connivance of both members in the same domicile is required (at least during a year). The civil marriage must be registered, trough public deed, on the notary. If you want to get an appointment with the notary for the civil union constitution in the fastest possible way, do not hesitate to contact us HERE. We will get your appointment immediately! Which are the documents that I should bring? However, the required documentation depends to a large extent on where the procedure is performed. The ones that we have exposed to you correspond precisely to the area of Barcelona. How long does it take to form a civil union in Barcelona? The constitution on the notary is realized immediately (especially if you let us help you with all the formalities of the constitution). However, there is usually a delay that ranges from 2 to 3 weeks for it to be recorded in the register of the city you initiated the process. From then on, all the formalities for the application process for the family member of the European Union citizen can be started, thus obtaining the residence permit in Spain. What is the minimum period that I should live with my partner in order to be able to constitute the de facto union? In general, Catalan law talks about two years of uninterrupted cohabitation, although there are many nuances to this general rule. Can I form a non-resident marriage in a city other than the one I am registered in? No. You can only form a civil marriage in the province where you are registered (on the census). DON’T WASTE ANY MORE TIME! START NOW WITH THE CONSTITUTION OF THE CIVIL UNION AND GET AN APPOINTMENT WITH THE NOTARY QUICKLY. WE WILL TAKE CARE OF EVERYTHING FOR YOU! How long do I have to be registered in a city in order to be able to initiate the process? Although the effective answer is a minimum period of 2 years, on many occasions it is possible to get to the constitution of the non-resident marriage having registered for shorter periods. If you have been registered for less than two years and need to complete all the procedures NOW, do not hesitate to contact us (info@balcellsgroup.com) so that we can analyze your particular case and find a solution together. How much does it cost to form a foreign marriage in Spain? The prices may vary according to the notary in which the public deed is carried out, the office and lawyers. In the case of Balcells Group, we manage the entire process of the civil marriage for you, getting an appointment before a notary as quickly as possible and filling in and getting all the necessary documentation so that you do not have to worry about anything, for only 350€. Where do I need to go in order to register as a non-resident marriage in Spain? It is not possible to register telematically or personally. Once the couple has been constituted on the notary, this institution will be in charge of sending the documentation to the registry so that the now contractual relationship can become legally effective. What are the advantages of constituting a civil marriage in Catalonia compared to other autonomous communities? The answer to this question is completely open. Depending on the city in which you are registered, the procedure may vary slightly, as well as the deadlines and the necessary documentation. Therefore we strongly suggest you contact our lawyers in order to benefit as much as you can from your current location laws. 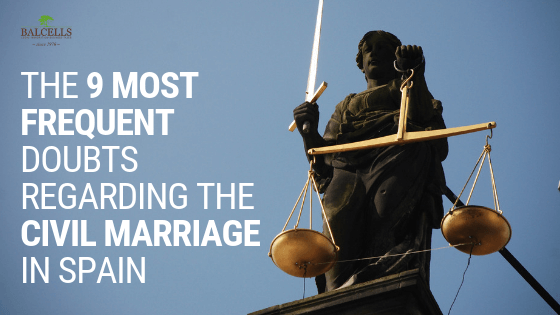 Is it better to constitute a marriage rather than a civil partnership? This question does not have a yes or no answer. There are many differences and similarities between marriages and civil unions, and determining what is better will depend 100% on your situation and interests. These are the 9 most frequently asked questions about the civil union in Spain. Do not forget that if you need legal advice of any kind, whether for the constitution of the non-resident marriage or for other formalities and processes such as wills, divorces or leases, we will be happy to help you. And, if you’re also interested, we’ll leave you a post in which we tell you the story of Jean and Fernando in their constitution of their civil marriage, so that you can live the whole process from the inside. Video included!